West Bromwich Albion have sacked chairman John Williams and chief executive Martin Goodman. The Baggies lost 3-0 at Chelsea on Monday and are bottom of the Premier League table, seven points behind 17th-placed Huddersfield Town. A club statement said the changes “follow Albion’s poor results”. Both Williams and Goodman “have been placed on garden leave with immediate effect”, with Mark Jenkins becoming the club’s new chief executive. 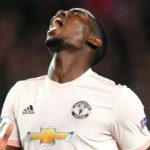 Paul Pogba’s attitude and inconsistency would not be accepted at Real Madrid, says Paul Parker, with more expected from a World Cup-winning Manchester United midfielder.